INTO GOAL after dynamic warm up. 4 = 6 dipping volleys. 1,2,3,4 represent the different postions taken by the GK&apos;s or Coaches. If used as a pre game warm up, the session should take no longer than 30 minutes. 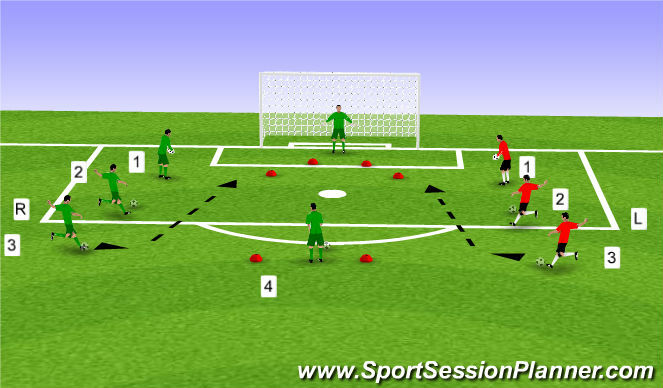 The set up shown could be used as a shot stopping exercise using GK;s and outfield players. For example the touch and hit position numbered 3 would be a realistic practice for Srikers as they would be encouraged to use both feet to shoot. Position 4 would be useful for midfield players to practice distance shooting, off the floor.half volley and volley. GK&apos;s would be encouraged to volley or half volley from position 2. Volley from position 1 with both left and right foot service. Session can be used as a warm up on pre-game day with the emphasis on quick feet movement over discs or slalom. The GK would then be asked "can you be best prepared" when the ball is delivered? Emphasis on Head/ Hands Feet.